How to break in new shoes in just a few seconds! I love love love fashion, but they’re two things that I absolutely hate… breaking in new jeans and new shoes. I’m sure I am not alone in that either! I came across this little trick that claims to break in your shoes in less than 2 minutes. If it really works this will be one the best keep secrets in your closet and best of all, no more blisters. Ever! Sounds fabulous, right? Put on a pair of socks and then slip into your shoes. Take your hairdryer and for a few seconds aim it on parts of your foot/shoe that feel the tightest and blister prone. Wiggle and stretch your foot inside the shoe as you’re doing this to get the maximum benefit. 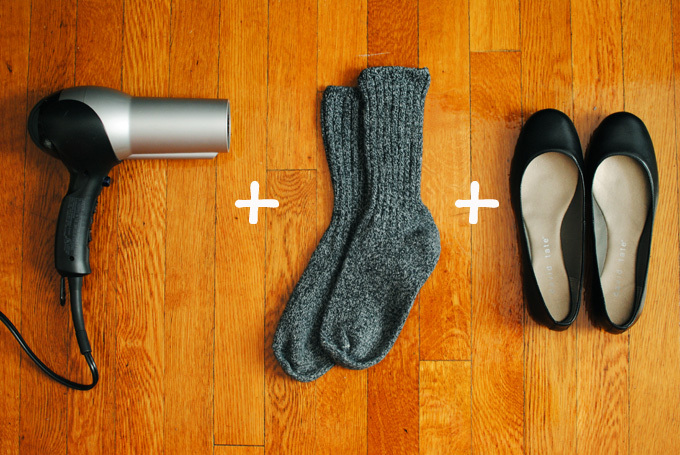 After a few seconds turn off the hairdryer, but keep the shoes on until they cool. Now take off the shoes and socs and test out the shoes. They should be stretched out just enough, but if you still need more room just repeat the process once again.